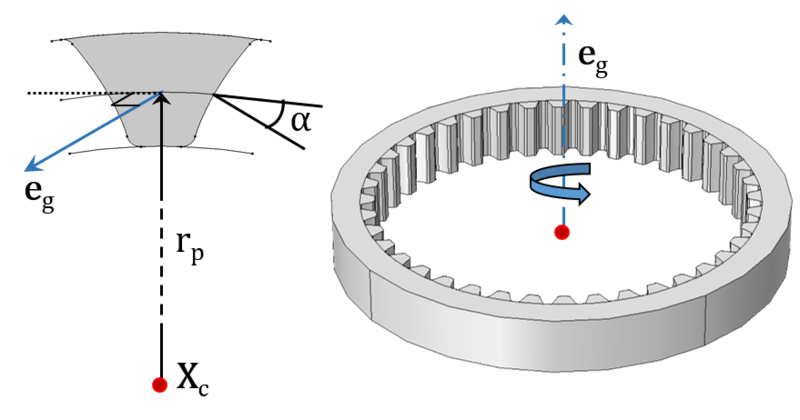 As a refresher, let’s begin by reviewing some of the key concepts behind modeling gears in COMSOL Multiphysics. A gear is defined in a Gear node as a rigid body with six degrees of freedom in the form of translations and rotations at the center of rotation. It is used in a Gear Pair node in the model tree in order to connect with another gear. Here, you can specify a finite stiffness for the gear mesh or gear tooth, either for individual gears or for the pair. A mathematical formulation is used to describe the connection between two gears, without any need for a defined, realistic gear geometry to detect the contact between the two gears. Therefore, you can represent a gear with either a realistic gear geometry or any similar geometry of a disc. It is possible to compute the inertial properties of a gear from the geometry using its calculated mass density, or you can directly enter the properties in the form of mass and moment of inertia in the node’s edit fields. You can also apply external forces and moments on the gear as well as constrain certain degrees of freedom of a gear. For instance, when modeling torsional vibrations, all of the degrees of freedom except the axial rotation can be constrained. COMSOL Multiphysics offers a number of standard gear types, each with its own merit and applications. As mentioned above, the gear is an abstract object, but if you want to add a realistic geometry for visualization, you can access the Part Libraries, where you can find various types of gears and racks. In the following images, you can see the various types of gears and racks available and the geometrical parameters needed for their mathematical descriptions. 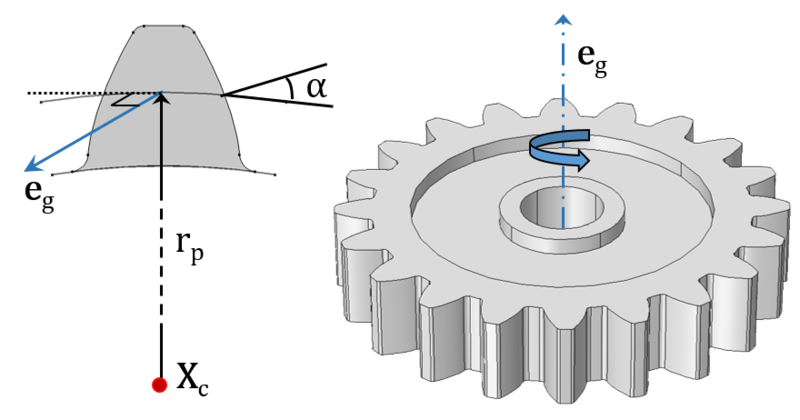 A Spur Gear (left) and Helical Gear (right) with their external gear mesh. A Spur Gear (left) and Helical Gear (right) with their internal gear mesh. A Bevel Gear (left) and Worm Gear (right). A Spur Rack (left) and Helical Rack (right). A screenshot showing the settings window for a helical gear. Various inputs required to model a helical gear, including gear properties, gear axis, center of rotation, and density are shown. The next step is to define the position and orientation of the gear. The gear position is defined in terms of the center of rotation. This is the point at which the degrees of freedom are created and the rotation is interpreted. The forces and moments acting on the gear due to meshing with other gears are also interpreted about this point. By default, the center of rotation is set to the center of mass of the gear, but there are other ways to define it explicitly as well. The gear orientation is specified in terms of the gear axis, which is the axis of rotation passing through the center of rotation. The gear axis is used when creating the gear local coordinate system. Also interpreted about this axis is the gear rotation, a degree of freedom in the Gear Pair node. You can mount gears in one of two ways: on a flexible or a rigid shaft. These devices can be mounted either rigidly or with a finite stiffness using a fixed joint. Joints are the features used to connect two components by allowing certain relative motion between them. When there is no clearance between the gear and the shaft in the geometry, the objects can be either in an assembly state or a union state. For a flexible shaft, gears are by default rigidly mounted on the shaft if both the gear and shaft are in a union state. It is not necessary to model a shaft in order to mount gears, as the devices can be mounted directly to the ‘ground’ either rigidly or with a finite stiffness using a hinge joint. The prescribed displacement/rotation subnode of a gear can also be used for this purpose. This can be done using hinge joints, which can be rigid or have a finite stiffness. Figure showing gears with an actual geometry as well as those modeled through equivalent discs. Different mounting methods for gears and shafts are also depicted. In order to connect the different types of gears that you have defined in your model, you can use a Gear Pair node. This node can connect spur, helical, and bevel gears. You can also use Worm and Wheel as well as Rack and Pinion nodes for their specific cases. These nodes connect two gears in such a way that there is no relative motion along the line of action at the contact point. The remaining displacements and rotations of the two gears are independent of each other. Rotation constraint: This establishes the connection between the wheel and pinion rotation using the gear ratio. The gear ratio is defined as the ratio of angular velocities of the wheel and pinion, and it can also be obtained by taking the ratio of the number of teeth of the pinion and the wheel. The effects of gear elasticity, transmission error, and backlash are also included in the constraint. Contact point constraint: This ensures that there is no relative motion at the contact point along the line of action. Unique triad constraint: This ensures that the coordinate systems of both gears are still unique and well defined. It is particularly useful for planetary gears. For a line contact model, one more constraint is added to restrict the relative rotation about a line joining the two gear centers. If friction is included, frictional forces are obtained using the contact force, which is computed as the reaction force of the contact point constraint. These frictional forces are then applied on both gears in a plane perpendicular to the line of action. All these checks are automatically performed and an error message is issued during equation compilation if the two selected gears are not compatible. 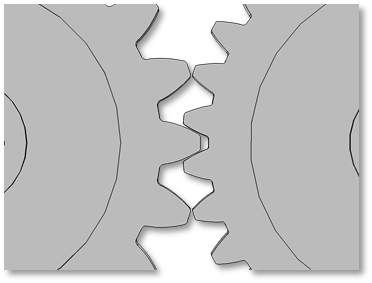 Examples of incompatible gear mesh. In the figure on the left, the gears have different modules. 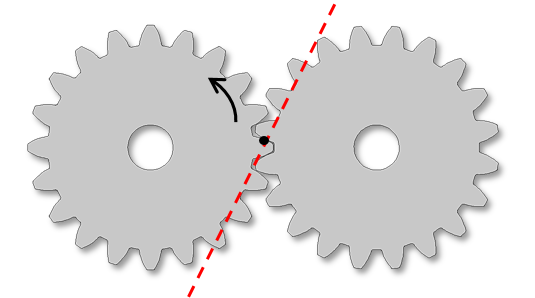 In the figure on the right, the gears have different pressure angles. A coordinate system for each gear is defined using the gear axis and center of rotation of both gears. The first axis of the coordinate system triad is the gear axis itself. The second axis is the direction pointing from the center of rotation to the contact point. The third axis is normal to the plane containing the first two axes. This coordinate system is attached to the gear and varies with the changes in gear orientation. Note, however, that it does not rotate with the gear rotation about its own axis. A schematic showing coordinate systems and other parameters for both gears connected by a gear pair. The gear tooth coordinate system is defined for both gears by rotating the gear coordinate system with the tooth angle matrix. This matrix is constructed using the helix angle and the cone angle. The line of action, meanwhile, is defined as the normal direction of the gear tooth surface at the contact point on the pitch circle. This is the direction along which the forces are transferred from one gear to another. It is defined by rotating the third axis of the gear tooth coordinate system (gear tangent) about the first axis of the gear tooth coordinate system with the pressure angle (α). Based on the direction of the driver gear, the gear tangent can be rotated either clockwise or counterclockwise. Two figures depicting the line of action and the direction of rotation of the driver gear. The line of action is defined due to the fact that the driver gear and tangent rotate in the clockwise direction (left) and counterclockwise direction (right). 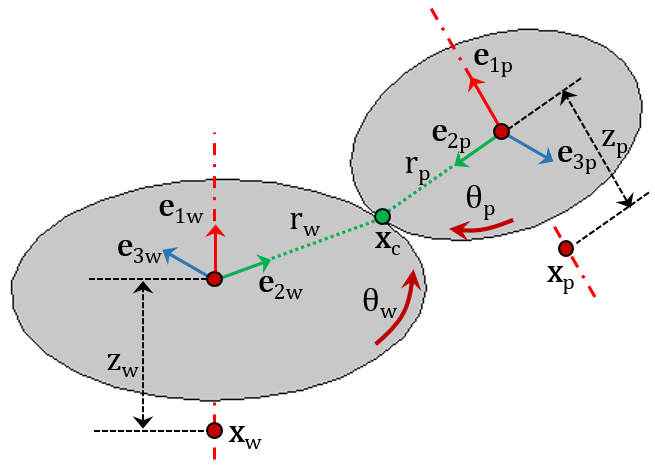 Using a weak-form constraint: In this method, the contact point constraint is implemented in the weak form and the Lagrange multiplier of this constraint is the contact force. This method is accurate, but it uses an extra variable for the Lagrange multiplier and requires proper scaling in order to have good convergence. Using a penalty method: Here, the constraint is implemented using the penalty method and the penalty force represents the contact force. This method does not require any additional variables, but an appropriate value for the penalty factor must be selected. For a configuration that is neither parallel nor intersecting, the contact point offset from the pinion, as well as the wheel center, is automatically computed. The reason for this is that there is always a point contact and the contact point can be uniquely determined. 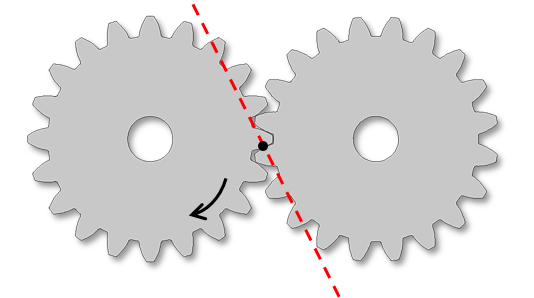 From left to right: Thin gears (point contact model), thick gears (line contact model), and thick gears with an axial offset. 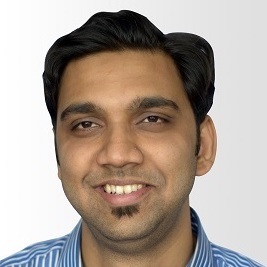 Now that we’ve explored gears in further detail and how to connect them, let’s look at various examples of gear pairs classified based on their configurations. You can use many gear pairs together in order to model complex parallel and planetary gear trains. 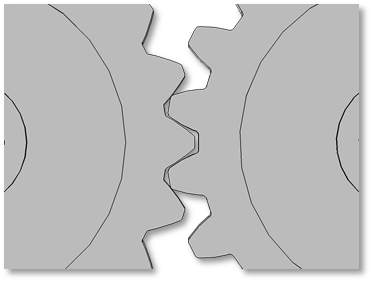 Bevel gears, meanwhile, offer an example of an intersecting axis configuration. Set of spur gears and parallel helical gears with an external gear meshƒ. Set of spur gears, one with an internal gear mesh and the other with an external gear mesh, as well as a set of bevel gears. 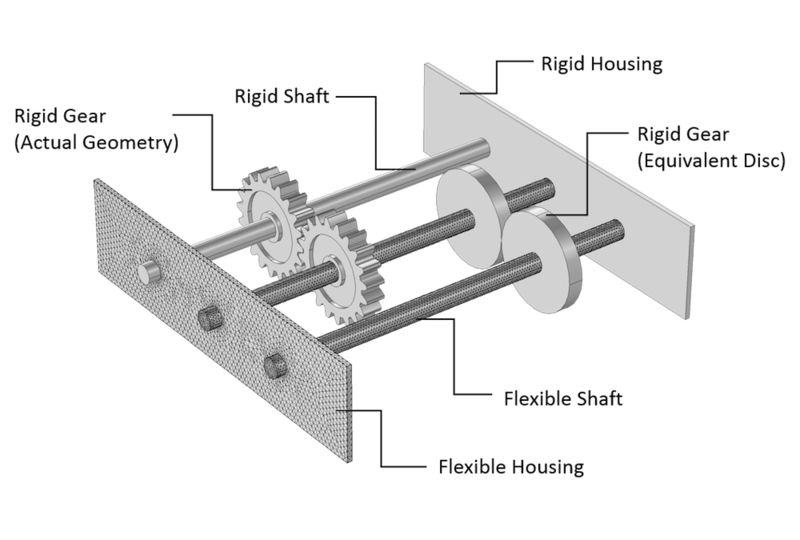 Set of crossed helical gears with an external gear mesh and the worm and wheel. Rack and pinion with a straight gear mesh. When it comes to modeling gears, there are many important elements to consider to optimize your simulation results. As we’ve demonstrated here today, the new features and functionality for gear modeling in COMSOL Multiphysics allow you to address such elements, providing you with more useful insight into how to improve your gear design. In the next blog post in our Gear Modeling series, we’ll discuss how you can use advanced features on your gear pairs (i.e., gear mesh elasticity, backlash, transmission error, and friction) in order to perform simulations requiring greater fidelity. We’ll also show you how these parameters affect the dynamics of your system. Stay tuned!